For decades there has been much debate about the appropriate dose of protein for maintaining or building muscle mass. Doses as low as the recommended daily allowance (RDA) of 0.36 grams per pound of bodyweight or as high as 2 grams per pound have been recommended. In addition, there has been much debate about protein timing and meal distribution. Fortunately, the scientific evidence has accumulated and has started to paint a clearer picture of what is appropriate. In this article, I will discuss the latest research on dietary protein and muscle hypertrophy, then I’ll discuss protein needs under three different physiological conditions, calorie excess (bulking up), calorie maintenance (maintaining bodyweight) and calorie restriction (dieting to lose weight). Finally, I’ll discuss some of the research on the safety and health impacts of higher protein diets. 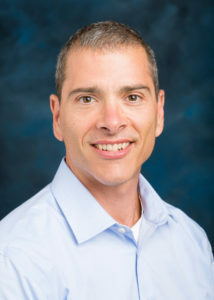 In January of 2018, a group of scientists from McMaster University in Canada authored an extensive review of the research literature on dietary protein and hypertrophy.1 In their excellent review, not only did they summarize the current state of the scientific evidence, but they also provided a novel theory about protein requirements based on cell biology and some indirect evidence. Let’s review the basic findings. Figure 1: Protein Utilization. 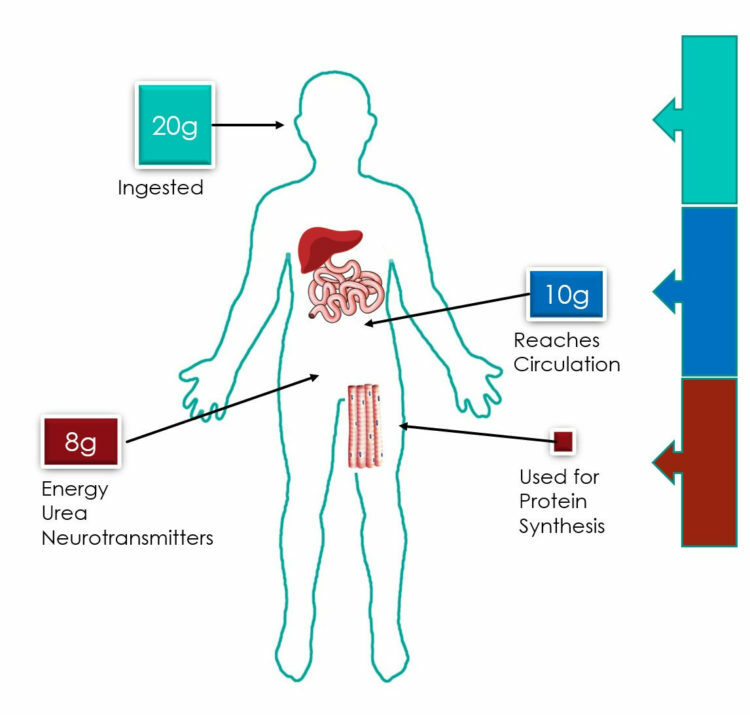 Of a typical 20g ingested dose, the liver and small intestines consume 10g, leaving 10g to enter the plasma. Of the 10g entering the plasma, approximately 8g is used for purposes other than muscle protein synthesis, leaving only approximately 2g for muscle protein synthesis. You might think that most of the protein that you consume enters the bloodstream and is available to the tissues, but that is not the case. For example, if you consume 20 grams of protein, the enterocytes (cells of the small intestine) and the liver consume about half (10 grams) of that ingested dose. The liver and enterocytes are among the most metabolically active tissues of the body and they will get a large share of all nutrients that we consume. Of the 10 grams that are now available to enter the bloodstream, about 8 grams will be used by other tissues for energy, to produce urea, and for synthesis of neurotransmitters and enzymes. Under normal conditions that leaves only about 2 grams of the originally ingested 20 grams for use by muscles for protein synthesis. Though this seems like very little, consider that if you incorporate only 1 gram per meal, and you eat four meals per day, that would add up to 1.5 kg in a year, or just over 3 pounds. You can see by that simple math why 4-5 lbs. of muscle mass gain per year is excellent progress for drug free bodybuilders. Scientists used to believe that protein was necessary for protein synthesis but played no role in regulating the process other than simple availability. We now know that this is not the case. In fact, protein, or specifically amino acid content of the plasma, can turn on protein synthesis in muscle. Muscle protein synthesis (MPS) is stimulated primarily by essential amino acids, particularly branched chain amino acids (BCAA), and specifically leucine. When a meal is eaten, amino acids enter the plasma and we reach a state of hyper aminoacidemia (higher than baseline amino acid concentration). This results in an increase in protein synthesis that peaks about 1-2 hours post hyper aminoacidemia. MPS rapidly returns to baseline after about 2-3 hours. Figure 2: MPS After a Meal. Approximately 1-2 hours after amino acids enter the bloodstream MPS peaks, but then returns to baseline after about 2-3 hours. To determine if MPS could be enhanced by consuming a larger bolus of protein, scientists measured MPS in response to different doses of protein. The table below shows the result of those studies. In young males .24 grams/kg was enough to maximally stimulate MPS. In older males, the required dose was higher, .40 g/kg. The corresponding value in grams for a 170 lb. and 220 lb. person is also given. MPS was not significantly higher with higher doses of protein, indicating that the response was saturated at this amount. We don’t eat our food for the day in a single bolus though. We eat a series of meals. Researchers compared three different protein dosing regimens and measured MPS throughout the day to determine which regimen resulted in the maximum sustained MPS. Each dosing regimen contained 80 g of protein per day. The regimens were: 20 grams of protein every 3 hours for 12 hours, 10 grams of protein every 1.5 hours for 12 hours, or 40 grams of protein every 6 hours for 12 hours. Figure 3: Protein Dosing Regimens and MPS. 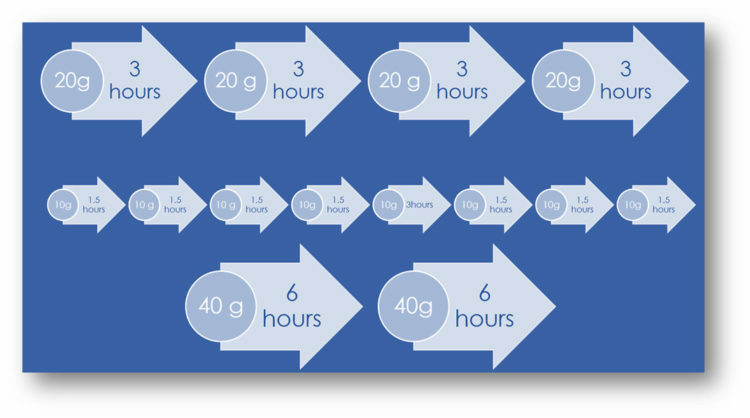 The 20g dose every three hours was shown to be superior, resulting in a higher sustained MPS throughout the day. The 20-gram dose every 3 hours was shown to be best. It resulted in the highest sustained rates of MPS. Recall that earlier we stated that 20 grams was enough to stimulate maximal MPS for an average young male (170 lbs.) so this finding is not surprising. The 10-gram dose was insufficient to maximally stimulate MPS and the extra 20 grams provided by the 40-gram dose would have added little or nothing to the MPS response. Additionally, the six hours between doses in the 40-gram regimen would have allowed MPS to return to baseline, unlike the three-hour timing of the 20-gram dose regimen. This research makes a compelling argument for a simple regimen of 20 grams (or 30 for older adults) every three hours. For a person who is awake for 15 hours and asleep for nine, this would result in five 20 gram feedings for 100 grams of protein total (for a 170 lb. person), much higher than the RDA in this case (RDA = 61 grams for 170 lbs.). Is that optimal? Would you like to receive an email when we publish new articles? Another factor that affects MPS is exercise. 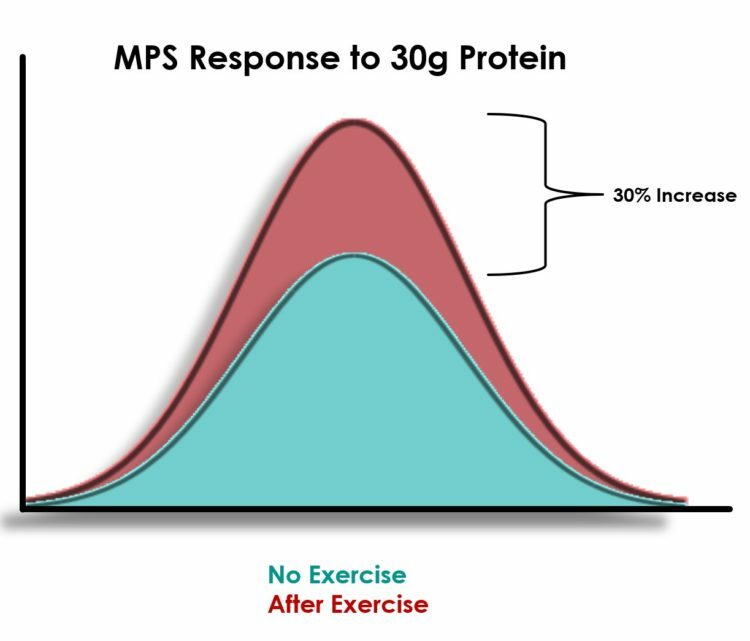 In fact, exercise amplifies the MPS response to protein. A bolus of protein results in 30% higher MPS if taken after exercise. This has led to the concept of the “anabolic window.” The “anabolic window” is the period in which this effect is present, and during which the stimulation of MPS by protein will be amplified. This has resulted in the widespread recommendation to consume protein immediately after a workout. Figure 4: Effect of Exercise on Protein Stimulated MPS. Exercise enhances the protein stimulated MPS by approximately 30%. 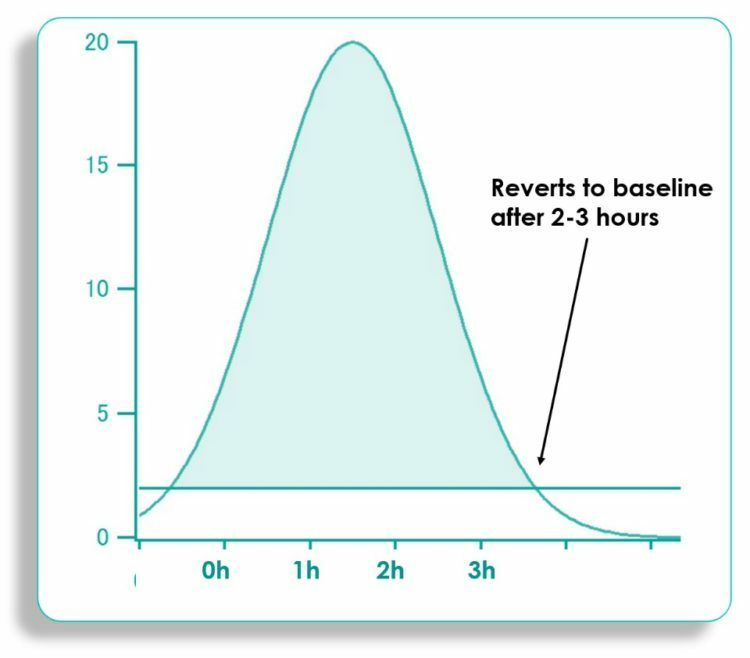 However, recall that the peak in MPS occurs 1-2 hours after hyper aminoacidemia, or the entry of large amounts of amino acids into the plasma. Hyper aminoacidemia occurs only after digestion and absorption, which also takes some time. Digestion and absorption could be as quick as 30 minutes for a whey protein shake, to as long as three hours or more for a mixed meal containing meat, fat, and carbohydrates. So, it is likely that consuming a whey protein shake immediately after a workout (or immediately before or during the workout) may have the same effect on MPS as consuming a meat based mixed meal 2-3 hours prior to a workout. This area needs more research. Figure 5: Notional Strategy for Aligning MPS with Workout and Protein Intake. The red arrow represents when the protein would be consumed, and the green arrow represents when a workout would begin (one-hour workout). The goal is for hyper aminoacidemia to coincide with the end of the workout when muscle is most sensitized to protein. MPS is not the only factor that determines the accumulation of muscle mass. Protein accrual (accumulation of muscle protein) is determined by the balance of MPS and proteolysis (protein breakdown). There is a constant, baseline level of proteolysis but the level can increase and decrease due to a variety of factors. Muscle accumulation can increase due to either an increase in MPS with no change in proteolysis, an increase in MPS and a decrease in proteolysis, or a decrease in proteolysis with either no change in MPS or an increase in MPS. In other words, muscle accumulation increases when the balance between MPS and proteolysis tilts towards MPS. 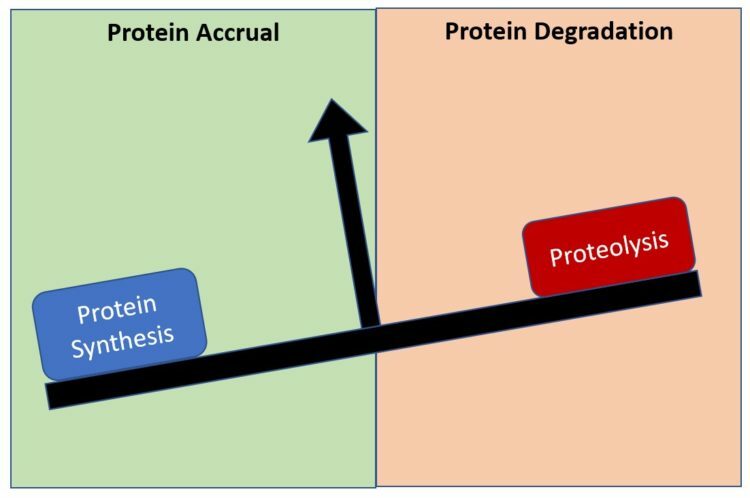 Figure 6: Balance Between MPS and Proteolysis Determines Protein Accrual. When the balance is tilted towards MPS, muscle accumulation occurs. Scientists can measure both MPS and proteolysis as well as protein accrual. 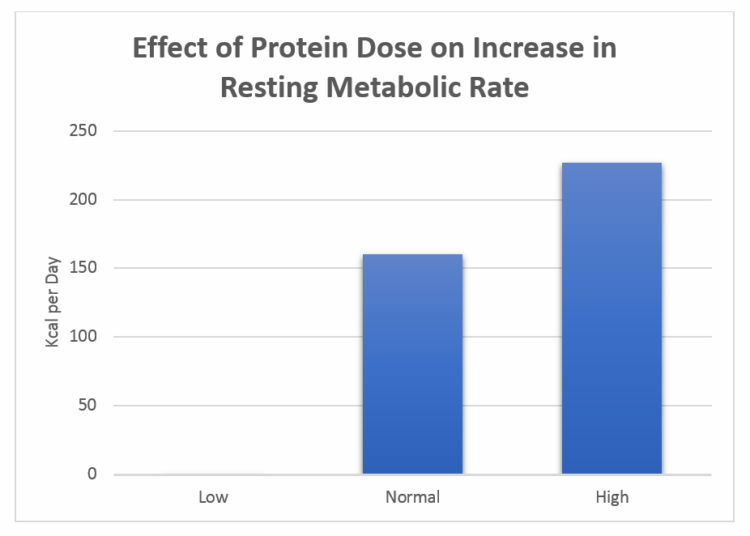 What the research data shows is that although a 20-30 gram protein dose is sufficient to maximally stimulate MPS, it takes approximately 70 grams of protein to inhibit proteolysis. At first glance, this would seem to be a good idea, because inhibiting proteolysis AND enhancing MPS should result in a significant increase in muscle protein accumulation (hypertrophy). However, Stokes et. Al (2018) argue that this might not be such a good idea. To understand their argument, let’s review a couple of details about protein synthesis and modification. Proteins are synthesized on specialized cell structures called ribosomes. After synthesis, the protein must be properly folded into the correct shape using “guide” molecules called chaperones, and often, modified by adding sugar molecules. This happens in a cell organelle called the endoplasmic reticulum (ER). Not all proteins are folded correctly. There is a constant, baseline level of improperly folded proteins that are present in the ER. 2. More chaperones are made. 3. Protein degradation is initiated (primarily through the Ubiquitin Proteolysis System (UPS). This is an important response because a buildup of unfolded proteins is toxic to the cell and will initiate apoptosis (programmed cell death). Stokes et. Al (2018) argue that because the UPS is an important part of cell health, it should not be inhibited constantly by large boluses of protein throughout the day. They cite some indirect evidence that inhibition of the UPS can reduce muscle cell size and function. In mice, if the ATG7 gene (part of the UPS), there is a 40% reduction in muscle size. In elderly women, lower expression of genes associated with the UPS results in sarcopenia (muscle wasting) and reduced muscle function. It appears that maintaining a robust UPS capability is important for muscle function. Also, the UPS becomes important after exercise due to muscle damage caused by training. Following resistance training exercise, the myofibrils (muscle proteins) can be disrupted and damaged. Most often seen is Z disc streaming. The Z disk is where the large contractile proteins are anchored and is subject to lots of stress during exercise. The damage must be repaired for adaptation to occur and for muscle function to be restored. Much like remodeling an old house, the first phase of repairing the damage is demolition, in which the damaged portions are degraded and removed. This is done, in part, by using the UPS. Stokes et. Al (2018) argue that chronically inhibiting the UPS by consuming large boluses of protein (> 70 grams) throughout the day might interfere with that process. Before we move on, it is important to point out two considerations. The first is that an occasional bolus of 70 grams or more of protein is not likely to be detrimental in terms UPS function. It would take a constant inhibition of UPS by consuming >70 grams of protein multiple times per day to really impair the UPS system significantly. The second point is that all we have is indirect evidence to support the theory that inhibiting proteolysis might be detrimental to muscle hypertrophy. Clearly more research needs to be done. However, Stokes et. Al (2018) make a compelling argument based on indirect evidence and the basics of cell biology. If we assume that Stokes et. Al (2018) are correct, then the regimen below should be optimal (20 grams for young adults, 30 grams for older adults). Figure 7: Notional “optimal” Protein Dosing Strategy to Maximize MPS Without Inhibiting UPS. The 20g dose is adequate for young adults, while 30g is needed for older adults. However, the interesting finding was that the high protein group gained more lean mass than the other groups. In this case, high protein resulted in more lean mass gains than the low protein group. However, at 8 weeks the difference between normal and high protein was not significant. To put this in perspective, 25% of calories for a 3,000 kcal per day diet would be 188 grams of protein. For the “normal” protein diet, 15% of calories for a 3,000 kcal per day diet would be 113 grams of protein. 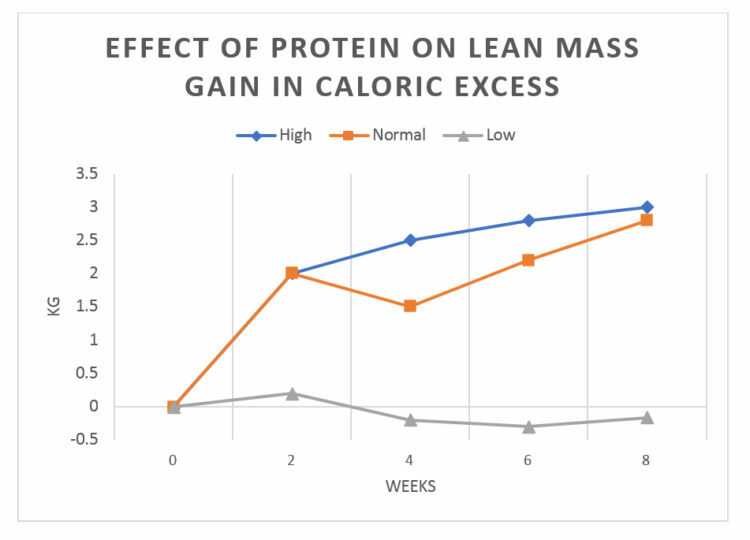 What this seems to indicate is that during a caloric excess, 15% and 25% of calories seems to be similar in impact in terms of lean body mass gain after eight weeks. The subjects in this study did not perform any type of exercise training, so the effect of concomitant exercise on this effect is unknown. However, based on the previous discussion on the sensitization of the protein response to MPS by exercise, it is unlikely that large amounts of protein would be necessary during overfeeding. Presumably, less protein would be used for energy (and more available for MPS) during caloric excess due to the readily available dietary energy. Another interesting finding was that protein intake impacted resting energy expenditure (resting metabolic rate). The low protein group did not increase RMR, but the normal and the high protein groups saw a significant increase in RMR, with the higher protein group experiencing the biggest increase. Weight loss during a caloric deficit consists of both fat and lean tissue. Much of the weight loss can come from lean body mass. Figure 10: Typical Weight Loss on a Caloric Deficit. 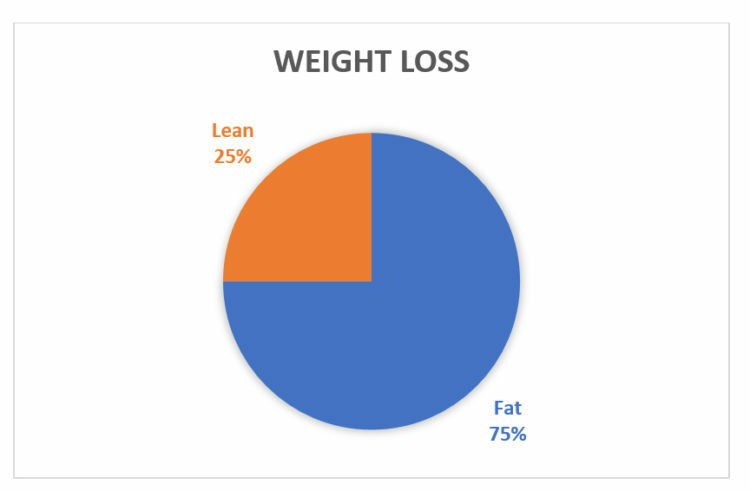 On average 25% of the weight loss is from lean body mass. One key to minimizing the loss of lean body mass is protein intake. 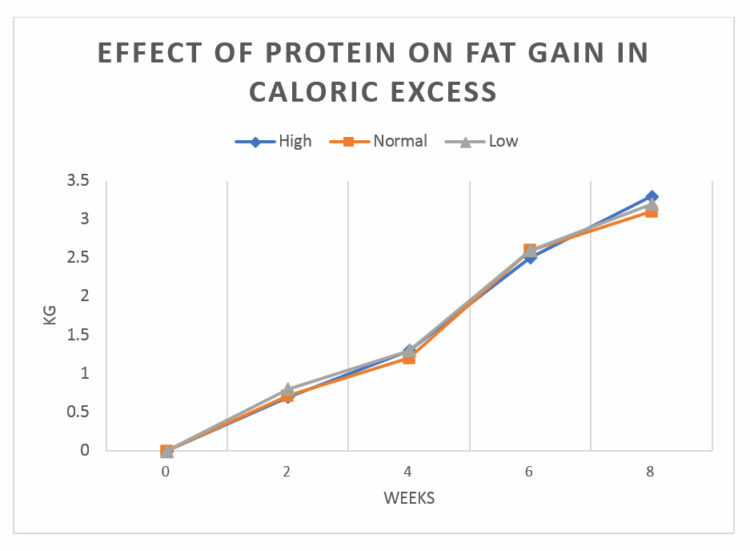 In contrast to caloric excess, protein needs increase during caloric deficit. We proposed earlier that 100-150 grams of protein per day was sufficient to maximize MPS during caloric balance (20-30 grams per bolus, every three hours, five times per day). Data indicates that it takes .73 grams per lb. of bodyweight to preserve MPS in a caloric deficit (prevent muscle loss) for non-training individuals and .73 grams per day to preserve MPS. However, for resistance training individuals, .55 grams per lb. was sufficient to maintain MPS. Interestingly, a protein intake of 1 gram per lb. of bodyweight led to an increase lean body mass. For a 175 lb. person, this would require 96 grams (maintenance) to 175 grams (mass gain) of protein daily. Figure 11: Protein Intake and MPS on Caloric Deficit. For resistance trained individuals, less protein was required to maintain MPS, however, 1 gram per lb. of bodyweight was shown to result in an increase in lean body mass. In addition to preserving MPS, there are other benefits from increased protein while in caloric deficit. In a review of the research literature on protein and weight loss, Halton, and Hu (2004) from the Harvard School of Public health present four additional benefits. 4. Replacing some carbohydrates with protein tends to improve blood lipids and blood pressure. So where does this leave us in terms of protein recommendations during a caloric deficit? Currently, the best supported recommendation for non-training individuals is to consume .73 grams of protein per pound of bodyweight in 20-30 gram boluses throughout the day. For resistance training individuals, the best supported recommendation is to consume 1 gram of protein per pound of bodyweight, in individual meals consisting of 20-40 grams of protein per meal. This increased protein intake will likely help with satiety and preserve muscle mass while dieting. Because MPS and satiety are both particularly responsive to Leucine, high quality proteins (which are high in Leucine) should be chosen. 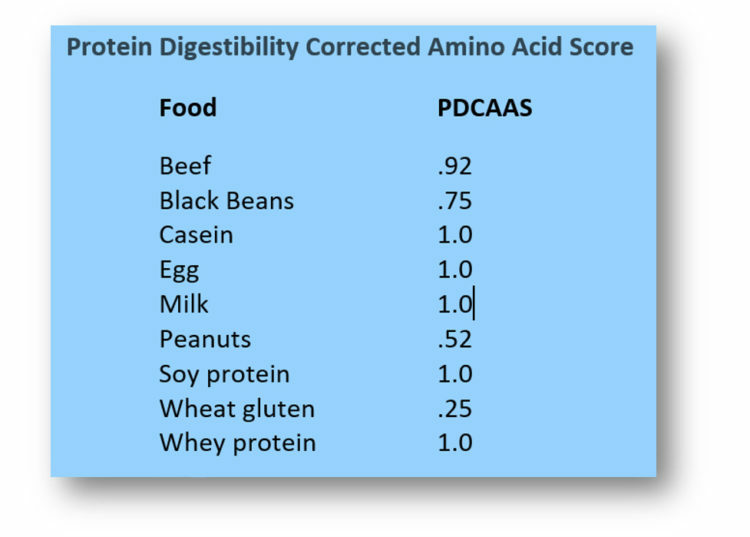 In addition to Leucine content, the Protein Digestibility Corrected Amino Acid Score rating is another way to choose a high-quality protein. Protein requirements are likely less than during caloric balance or deficit, but protein intake at 15% of calories (i.e., 115 grams for a 3,000 kcal per day diet) may result in greater MPS and a slightly higher resting metabolic rate. It is unlikely that ultra-high protein intakes (i.e., >200 grams per day) will provide an additional benefit. 20 grams (for young adults) or 30 grams (for older adults) in a single bolus is enough to maximize MPS. The optimal dosing regimen is 20-30 grams, every three hours. Resistance training sensitizes the muscle to the MPS enhancing effect of protein. Proper timing of protein intake may be beneficial. Avoid ultra-high protein intakes throughout the day (> 70 grams per meal) on a consistent basis to prevent inhibition of protein turnover. for non-training individuals is to consume .73 grams of protein per pound of bodyweight in 20-30 gram boluses throughout the day. For resistance training individuals, consume 1 gram of protein per pound of bodyweight, in individual meals consisting of 20-40 grams of protein per meal. The impact of these recommendations is enhanced by choosing high quality protein sources. Mike Prevost holds a PhD in exercise physiology from Louisiana State University. He specialized in muscle physiology and metabolism. He has trained athletes for many different sports including triathlon, ultra-running, surfing, power lifting, bodybuilding, mixed martial arts, football, basketball and more. After finishing his PhD, he took a commission in the U. S. Navy as an Aerospace Physiologist in the Navy Medical Service Corps. He trained thousands of aviators and aircrew on survival techniques, physiology, and human performance. He also served as the Director of the Human Performance Laboratory at the U. S. Naval Academy, where he performed physiological testing of athletes to improve performance. He has taught Exercise Physiology, Strength and Conditioning Laboratory and Anatomy and Physiology Laboratory at Loyola Marymount University. He has over 25 years of experience in working with athletes. Fat loss expert Josh Hillis teams up with strength coach Dan John to provide a clear, simple and realistic approach to fat loss. Start turning around your eating habits for good using Josh’s unique habit strategies, and then turbocharge your fat loss with the special fat loss exercise programs in the book. Let's get cooking! Stella's Kitchen will teach you how to cook healthy, well-balanced meals for you and your family. The delicious meal and snack selections emphasize protein intake and the consumption of minimally-processed complex carbohydrates. As an elite athlete in several sports, Mark Reifkind has his share of serious injuries, surgeries and chronic pain. Yet he's been able to recover far beyond expectations. In this three-hour workshop video, he'll show you what he did, and explain how these techniques can work for you or your clients. This is a discounted bundle of the two Josh Hillis Fat Loss Habits Coaching lectures. Nutritionist Mike Rousell's powerful fat-loss ideas will show you how you or your clients can burn calories around the clock, set up a diet in a no-fail environment, and snack and fuel the way to greater weight loss. Inside the OTP Vault, you’ll find over 20 articles and videos from leading strength coaches, trainers and physical therapists such as Dan John, Gray Cook, Michael Boyle, Stuart McGill and Sue Falsone. Click here to get FREE access to the On Target Publications vault and receive the latest relevant content to help you and your clients move and perform better. Stokes T, Hector AJ, Morton RW, McGlory C, Phillips SM. Recent perspectives regarding the role of dietary protein for the promotion of muscle hypertrophy with resistance exercise training. Nutrients. 2018;10(2). doi:10.3390/nu10020180. Bray GA, Smith SR, Rood J, et al. on Weight Gain , Energy Expenditure ,. 2012;307(1):47-55. Journel M, Chaumontet C, Darcel N, Fromentin G, Tomé D. The Neuroscience of Natural Rewards : Relevance to Addictive Drugs. J Nutr. 2005;22(5):322-329. doi:10.3945/an.112.002071.322.